Welcome to the Georgetown-Millsboro Rotary Club's website. We are located﻿ in the center of Sussex County, Delaware in the heart of the DelMarVa Peninsula. This area is known as Lower, Slower Delaware and we are happy to live and work here. We meet at Mulligan's Pointe (formerly Sussex Pines C. C.). ﻿Please join us any Tuesday at noon (except the fourth Tuesday when we have a Club Assembly to conduct business). Please click on the Speakers page for a list of upcoming speakers and topics. We look forward to seeing you soon. The Flags for Heroes 2019 campaign "kicked off" on March 5th. Over 500 American flags will be proudly displayed in four locations in Georgetown and Millsboro the week before and the week after Memorial Day. Please consider honoring our active duty military, veterans, police, firefighters and first responders with a $50 flag sponsorship. Businesses are welcome to honor their heroes at the Gold ($1000), Silver ($500) or Bronze ($250) levels. We presented $2000 checks to five local organizations as part of our annual Community Grants program. Recipients included: Clothing Our Kids, Community Resource Center, Del-Mar-Va Council, BSA, Lutheran Church of Our Savior and Southern Delaware Therapeutic Riding. 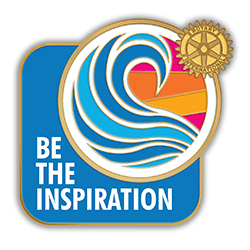 Please visit the Rotary District 7630 website for information on District events. Also see the event calendar on DaCdb. This website was created and is maintained by Dan Tabler. Suggestions for improving the site are always welcome as are proof readers. l-r: Dan Tabler, Ray Bryant and Bud Clark at Easter Seals Camp Fairlee 2019 Work Day. Christian Storehouse Director Steve Smith spoke to the club on April 9th and received a check from President Ray Bryant to help feed Millsboro students. Steve is pictured on the right and Ray on the left. We donated $1100 and dozens of new socks to the Georgetown Presbyterian Church's Emergency Shelter. Pictured (l-r): Karen Hurley, Cathy Bassett, President Ray Bryant, President Elect Alice Erdly, Mike Williams, Leanne Vasold and Nick Ricciuti. J. G. Townsend, Jr. & Co.